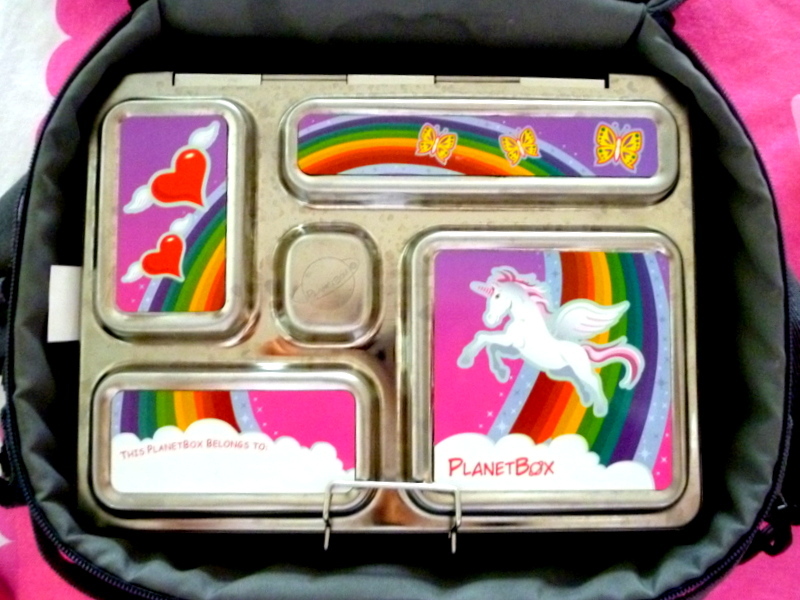 A lunch box doesn’t get much more snazzy than this! PlanetBox wasn’t just a random choice from the local supermarket; oh no, this is the fruit of a fair few hours’ research on the Internet. 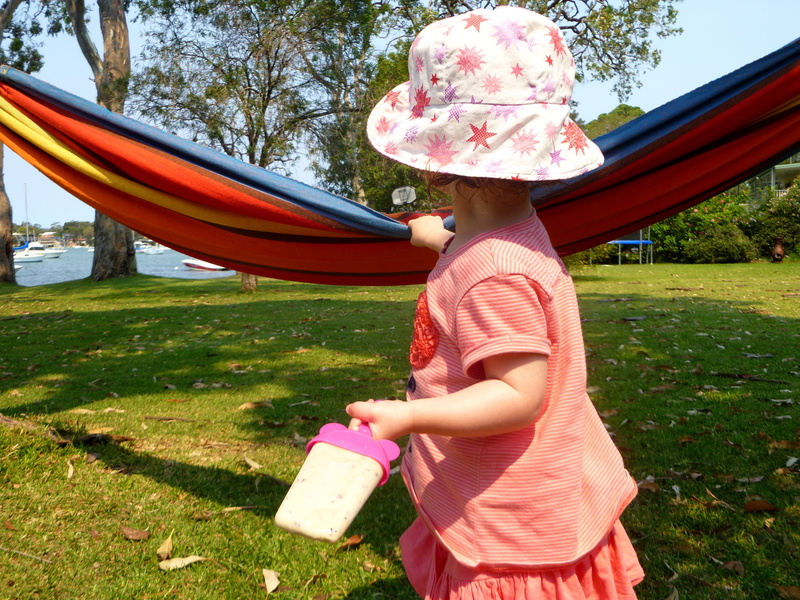 I decided late last year that Ickle could do with a more comprehensive solution for taking her snacks to daycare. I happened to be going through an anti-plastic stage at the time, and PlanetBox kept cropping up as an alternative worth a closer look. It definitely sets out to appeal to the eco market (although let’s forget about the distance it travelled from the US* to get to my front door). Much has been written about the dangers of using plastic containers for food storage; lead, BPAs and phthalates are just some of the nasties that can leach into food and drink, with potentially damaging consequences. So, I figure the less I use plastic, the better. 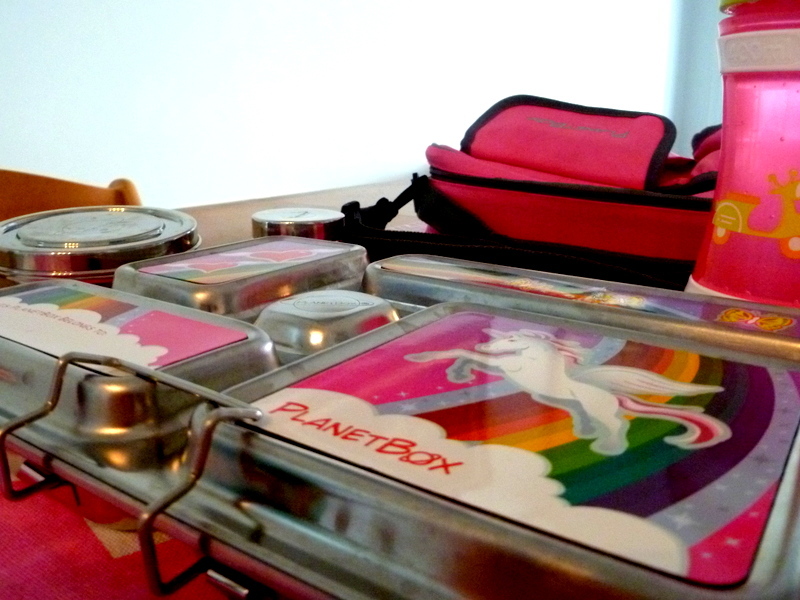 Made from stainless steel, PlanetBox strikes me as a modern take on an Indian tiffin carrier crossed perhaps with a thali tray. It comes in three different sizes and configurations. Given Ickle’s propensity for grazing at mealtimes, we opted for the Rover, which has a variety of different sized compartments. The Rover package includes a Big and Small Dipper, two stainless steel containers with silicone rubber seals to prevent sloppy, wet foods from leaking. We also succumbed to a set of magnets for decoration and a bright pink carry bag,. Yup, the full whammy. Well, it was a Christmas present, after all. 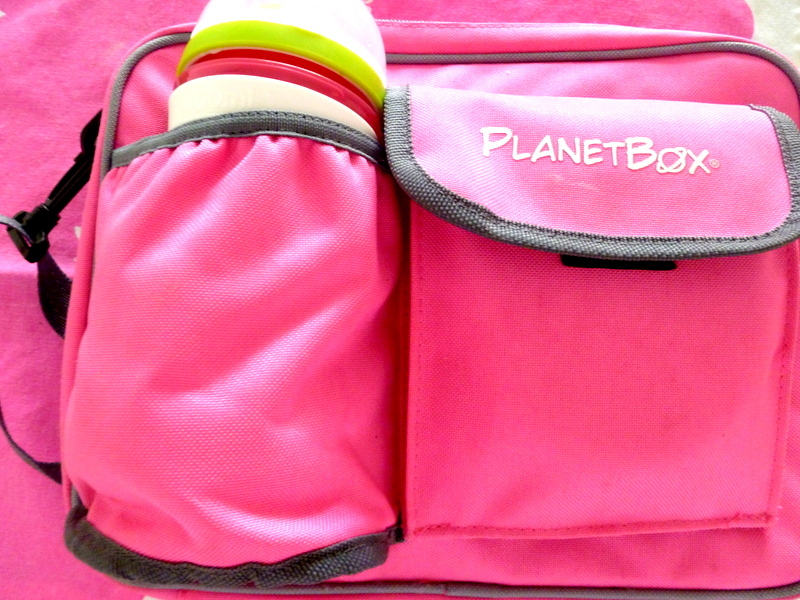 In short, we love our PlanetBox. It’s not without its downsides, of course. First, at $85 (AUD) for the kit (as per pricing on biome.com.au at the time of writing), it doesn’t come cheap (let’s hope it lasts, hey); the seal on our Big Dipper has never stayed in place and I binned it a couple of weeks ago (so no wet, sloppy food in that container, then); last, it’s pretty heavy, so all very well for me to cart to and from daycare, but how will Ickle get on when she starts at pre-school, and needs to carry it with all the other stuff kids need to take with them? *PlanetBox is now available in Australia from biome eco stores – presumably they ship them en masse, so guaranteeing a lower carbon footprint per item. 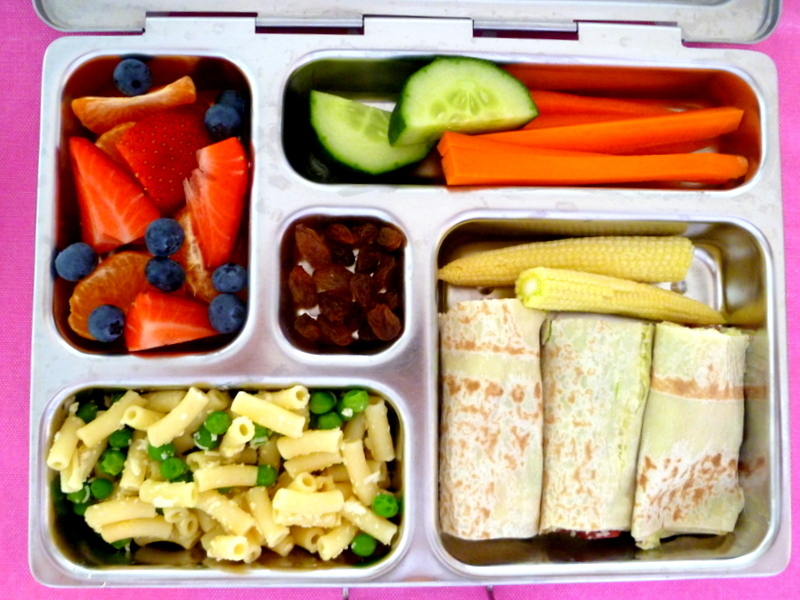 This entry was posted in Food, Ickle things and tagged Big Dipper, BPAs, lead, Little Dipper, phthalates, PlanetBox, Rover, thali tray, tiffin carrier on August 30, 2014 by Laura. Well, hello. What have we here? I can’t claim credit for Clive, although I did remember to water him once we got him safely home from playgroup. Ickle was in charge of his design and delivery, and she has been quietly tracking his progress ever since. 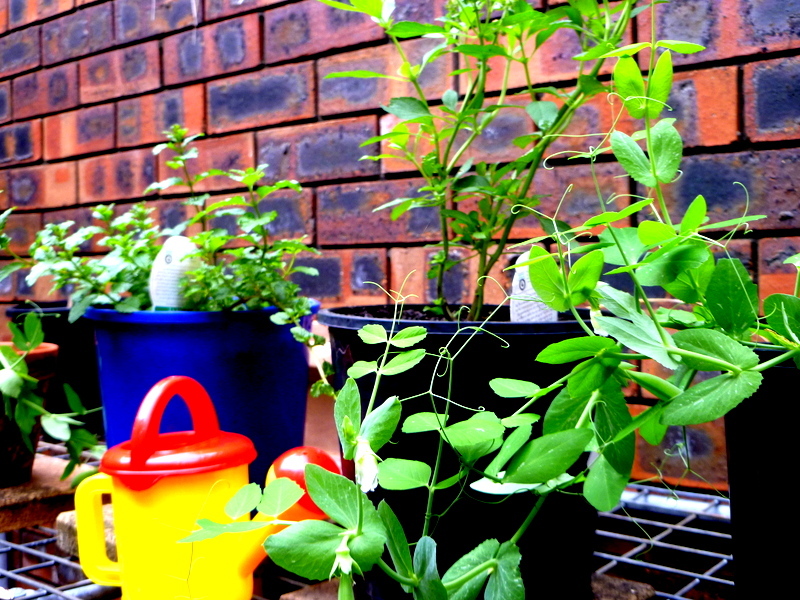 In fact, he has been much more of a hit than the little veggie and herb pots we planted a while back. That experiment has not been a huge success, I must admit. Our peas yielded the grand total of 6 dry little nuggets; the baby carrots are currently the size of my thumbnail (surely even baby carrots grow bigger than that? 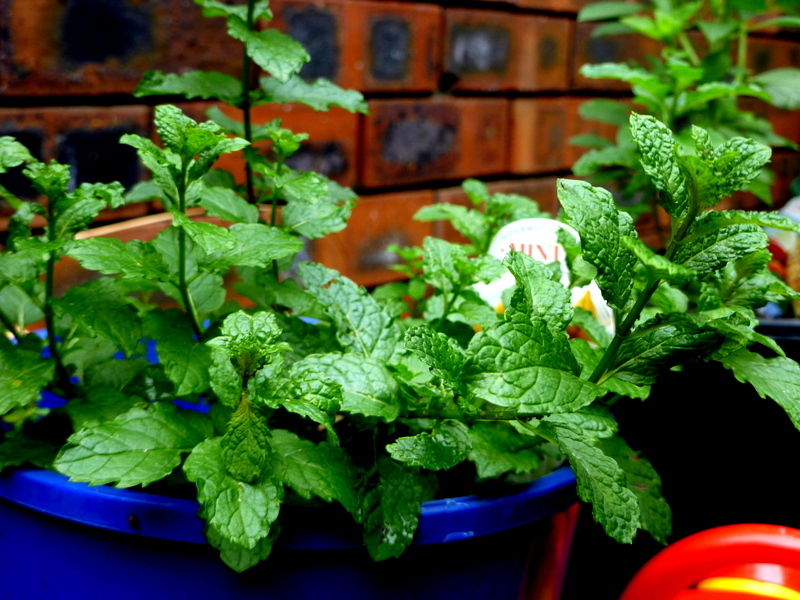 ); and the mint has decided to shrink rather than grow. Only the basil and parsley are hanging on in there. Not that I am put off. 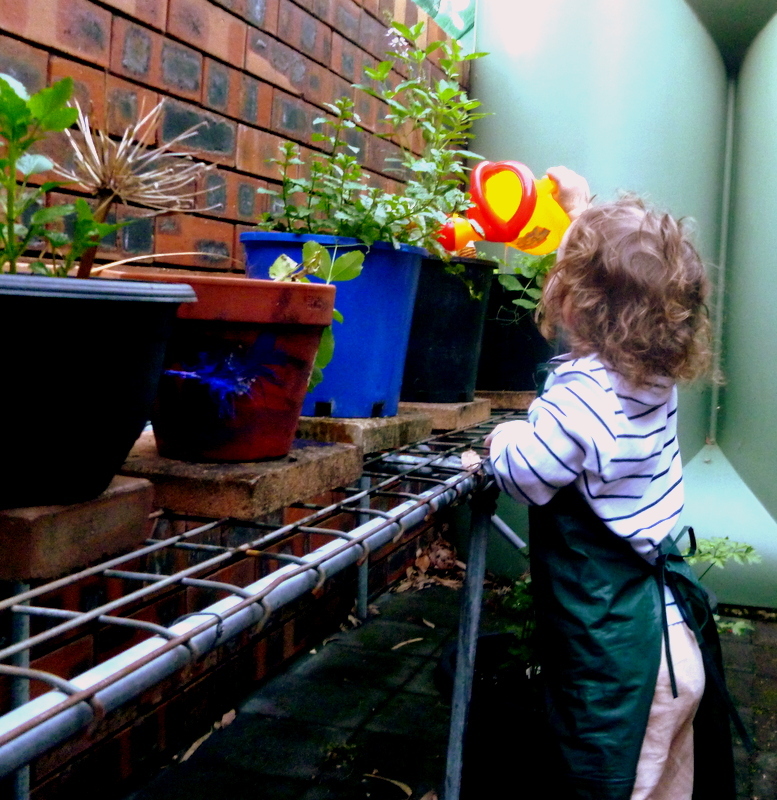 On the contrary, we shall try again and be assiduous in our watering efforts next time around. And we’ll make a success of it, just like Clive. 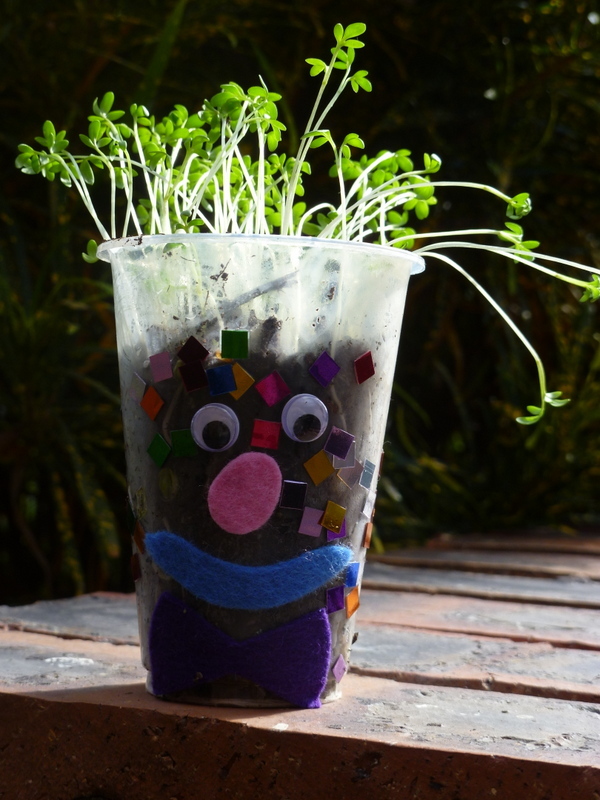 This entry was posted in Easy-peasy craft, Food, Ickle things and tagged basil, carrots, Clive, cress head, mint, parsley, peas, veggie and herb pots on August 15, 2014 by Laura. Sometimes I wonder whether Icklegen is getting enough veg in her diet. There are times when she will happily tuck into broccoli spears and green beans, and others when she turns her nose up at everything I put in front of her. 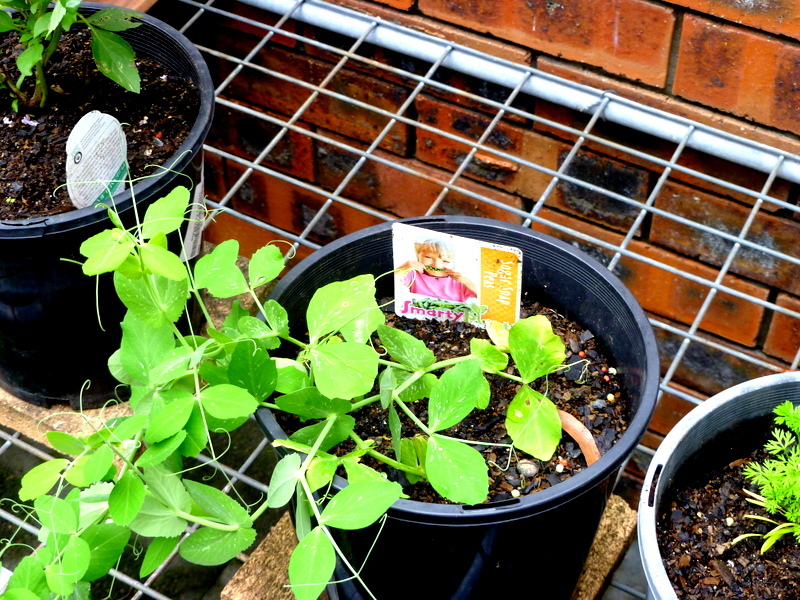 So, I do resort to disguising and hiding veg in unsuspecting locations. 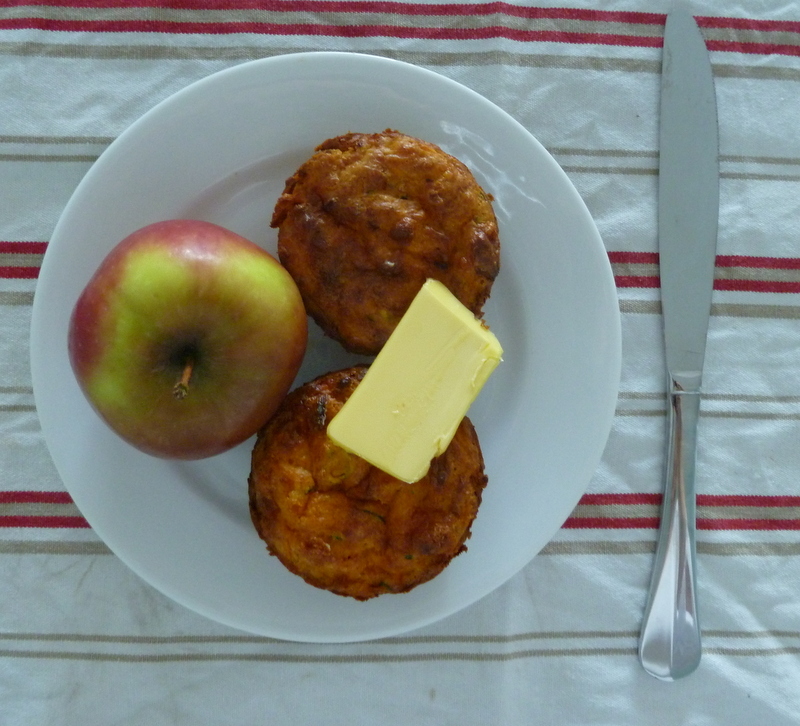 And one of my favourite, and most successful, attempts to-date has to be Veggie Muffins. This recipe manages to stuff a phenomenal amount of healthy veg (grated carrots, pumpkin and courgette/zucchini) into a savoury cake base. And the resulting muffins taste pretty good too, especially warm from the oven with a extra dab of butter and some cheese; otherwise, they can be a bit on the bland side. Ickle and I often make a batch together. 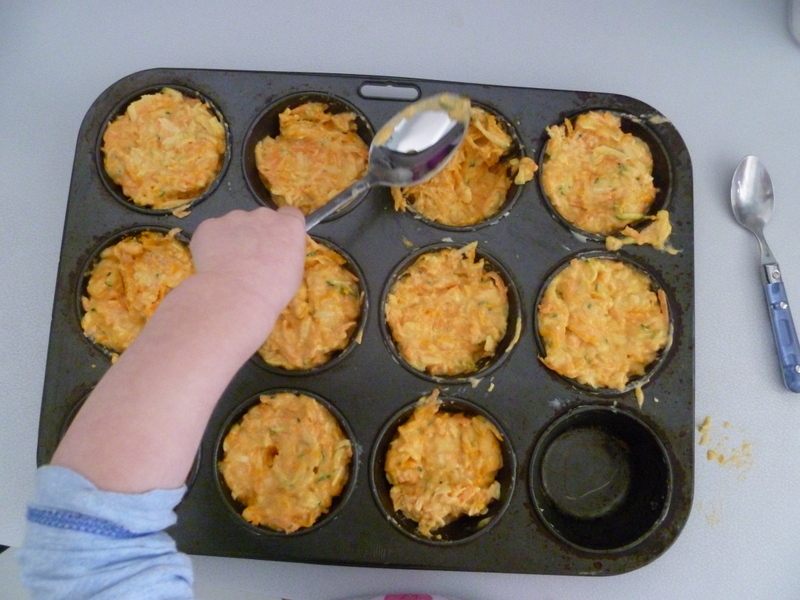 She loves to eat her veggie muffins warm or cold, and I occasionally pop one in her lunch box as an alternative to a sandwich. Note: I’m still experimenting with the baking time, as my batches seem to take a whole lot longer than 20 minutes to cook through. Maybe it’s just my oven. 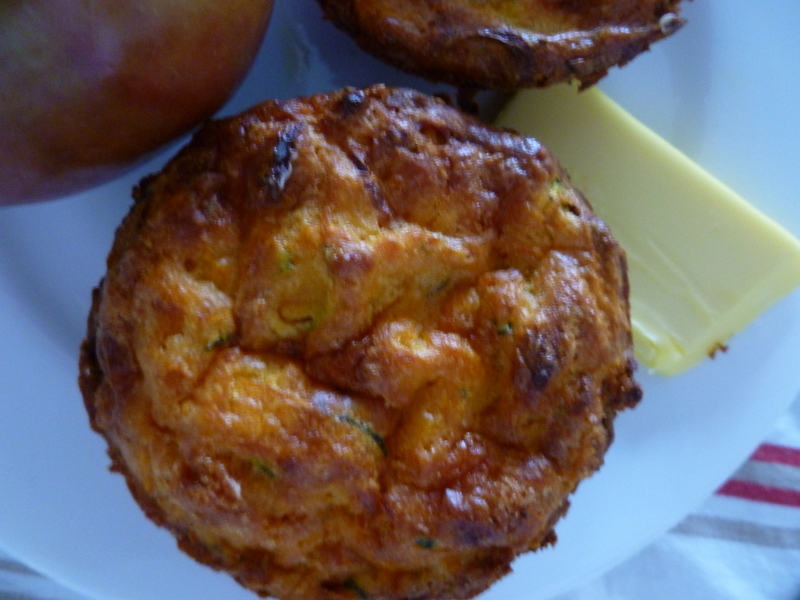 This entry was posted in Food and tagged sandwich alternative, veg, veggie muffins on June 29, 2014 by Laura. These little treats are perfect for snacking, lunch boxes, trips to the park and beach. Icklegen and I first sampled bliss balls a while back. If I remember rightly, that particular variety was made with Cherry Ripe bars (a classic Aussie chocolate bar, with, erm, a cherry and coconut filling). They were delicious but probably best not eaten on a regular basis. 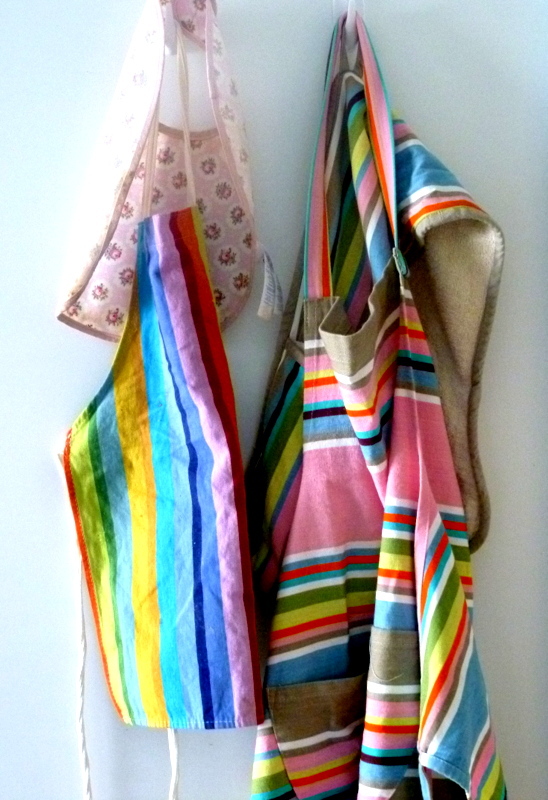 Prepare for a blizzard to hit your kitchen – aprons are definitely advisable. 1. Soak the dried apricots in warm water for around 30 minutes, then drain them well in a sieve reserving the water (you can probably skip this step if you’re using the non-organic variety). 2. Throw all the ingredients in a blender and process until the mixture starts to clump together. 3. Add some of the reserved ‘apricot water’ if the mixture is too dry. 4. Take small amounts of the mixture and roll into balls. 5. 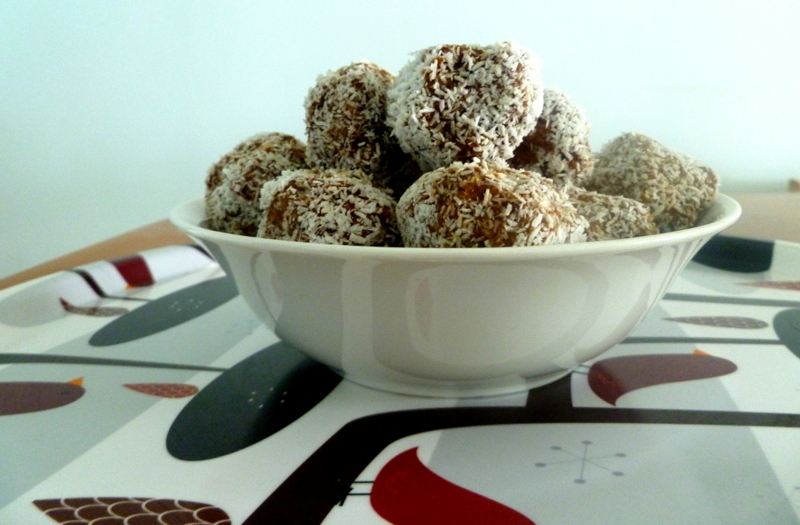 Pour some desiccated coconut onto a plate and roll the balls around in it until they are coated. Makes around 20-24 bliss balls, depending on size. We’re still experimenting with different ingredients and flavours for this recipe. Daddy Ickle reckons the result is a bit ‘soft’ and has suggested we bump up the nut content. So we’re going to look into using more coarsely ground almonds, or walnuts, in our next batch. We’ll report back in due course! * Organic apricots are not the most attractive looking food – all brown and leathery – but I prefer to buy them as they are free from sulphur dioxide. They plump up well after soaking and are yummy by themselves and in cooking. 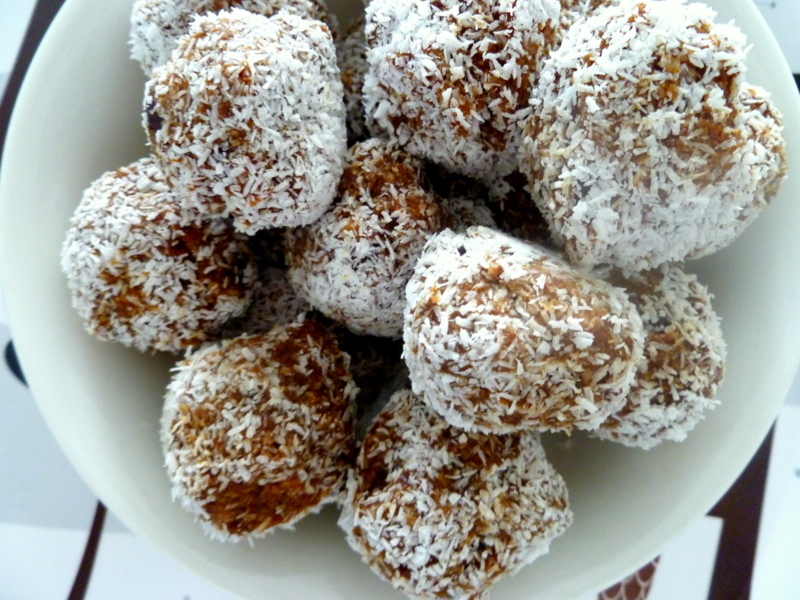 This entry was posted in Food and tagged aprons, bliss balls, blizzard, Cherry Ripe, coconut, dates, organic apricots, sulphur dioxide, tahini on January 29, 2014 by Laura. Ice lollies, or ice blocks as they are typically known as round here, are the ultimate summer treat, but the shop-bought variety are often full of added sugar and nasties. So we are experimenting with making our own, and it couldn’t be easier. Our current favourite is a tropical mix of banana, mango and coconut milk with a spoonful of honey to sweeten. I found the original recipe here when I desperately needed to use up some over-ripe fruit on a day when it was way too hot for baking (muffins are my usual handy standby). You simply peel and prepare the fruit, throw it in a blender with the coconut milk and honey to taste, pour into lolly moulds and pop in the freezer. The mix easily fills our four moulds, and there is generally a little to spare – yummy as a mid-morning smoothie snack! Icklegen loves them; despite being ickle she has proved herself more than capable of eating a whole ice lolly in the afternoon, and then gone on to have a decent tea later. And, because they are dairy-free, Daddy Ickle can indulge on occasion as well. For our latest batch, Ickle and I popped in a handful of fresh blueberries – it’s the season for these ‘wonder’ fruit over here, so make the most of them while they last. Yum. Don’t those lollies look good? And they taste even better, I can assure you! So, don’t delay any further and whip out that blender right now, people. 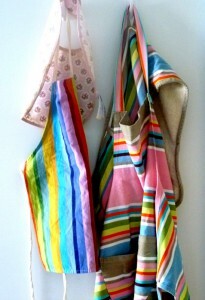 What is your favourite fruity mix for homemade ice lollies/blocks? 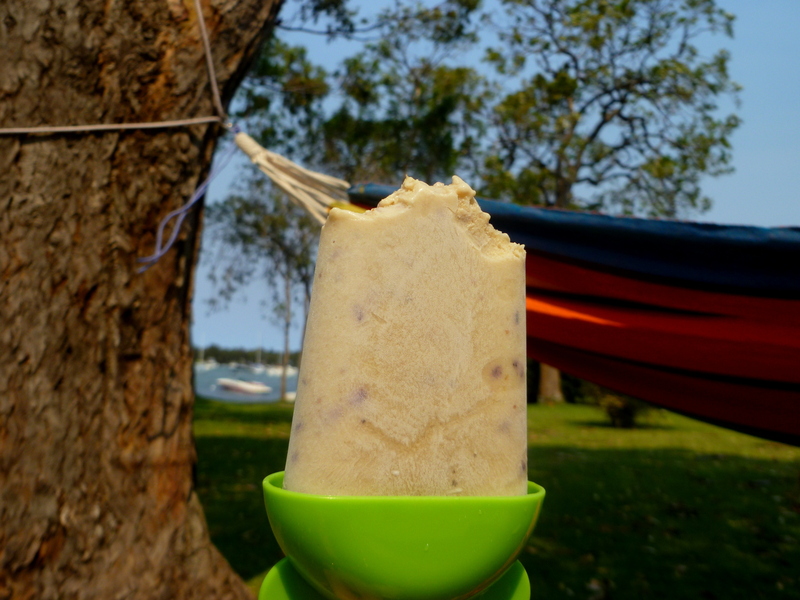 This entry was posted in Food and tagged banana, blueberries, coconut milk, dairy-free, homemade, honey, ice blocks, ice lollies, lolly moulds, man;, wonder fruit on January 7, 2014 by Laura. Icklegen and I barely ventured out of the house on Friday. We awoke to rain and by about 9.30 am the sky had darkened and the thunder had started to rumble. What were we going to do today to keep ourselves busy, I wondered. Well, baking has always been high up on my hit list on bad-weather days. There is something so therapeutic about putting the oven on and creating a delcious, sweet treat to enjoy when it is cold and/or wet outdoors. The question was: would Icklegen buy into my enthusiasm? 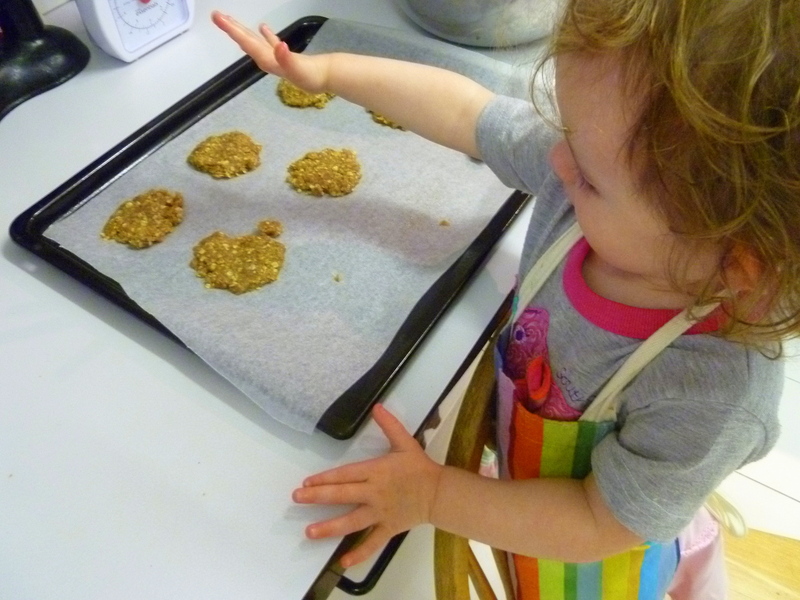 I opted for a simple recipe: Anzac biscuits. I’m not hugely into complex cake and biccie recipes actually – give me banana muffins and choc chip cookies over complex toppings, colours and sprinkles any day. I’m sure that will all change for special birthday girl celebrations over the next few years, when I’ll be called upon to create fairy princesses with impossible swirly pink glittery icing and other such flights of fancy. 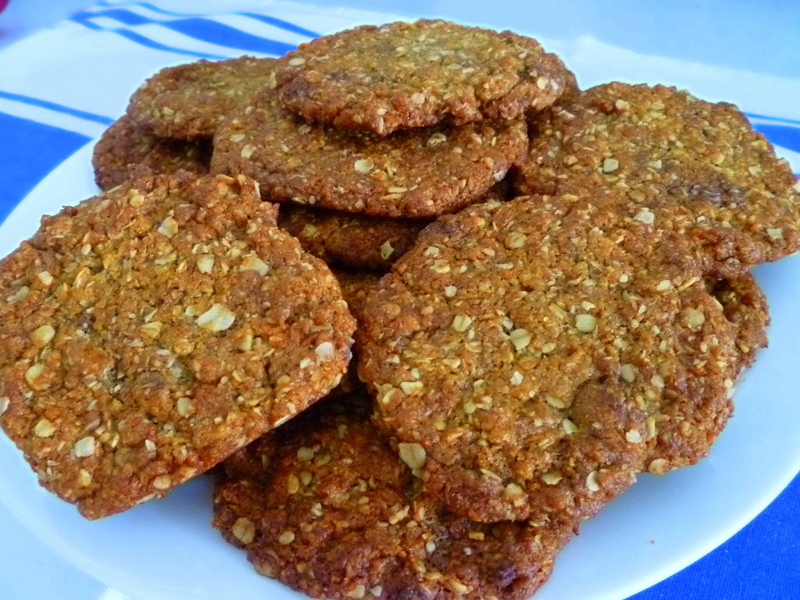 I love the story behind the recipe: it is believed that Anzac biscuits were made and sent to soldiers during WW1 by their loved ones back home. They have a relatively long ‘shelf life’ (they don’t contain egg like a lot of biscuit recipes), so could still be enjoyed when they arrived with the troops overseas. They are now forever associated with the Australian and New Zealand Army Corps (ANZAC). The recipe that I found when I first decided to have a go at baking Anzac biscuits myself was – dare I say it – from a UK site: BBC GoodFood. I don’t know whether it would be classed as a ‘traditional’ recipe, but all the key ingredients are there, and the end result has never disappointed. The biscuits are crunchy on the outside, but still soft and chewy inside – very moreish! Would they work with a toddler as my sous-chef, though? I decided to gather my ingredients and cooking materials together in advance. I’ve discovered there’s nothing worse than trying to organise myself in the kitchen with Icklegen fluttering around my feet. Step one complete, we donned our aprons, carried a wooden chair into the kitchen so Ickle was at counter-height, and set to work. We continued with our great teamwork skills: I spooned the mixture out onto trays and Icklegen patted the biscuits into shape. Then we popped them in the oven for about 8 minutes and hey presto: tasty, homemade biccies for our morning tea. 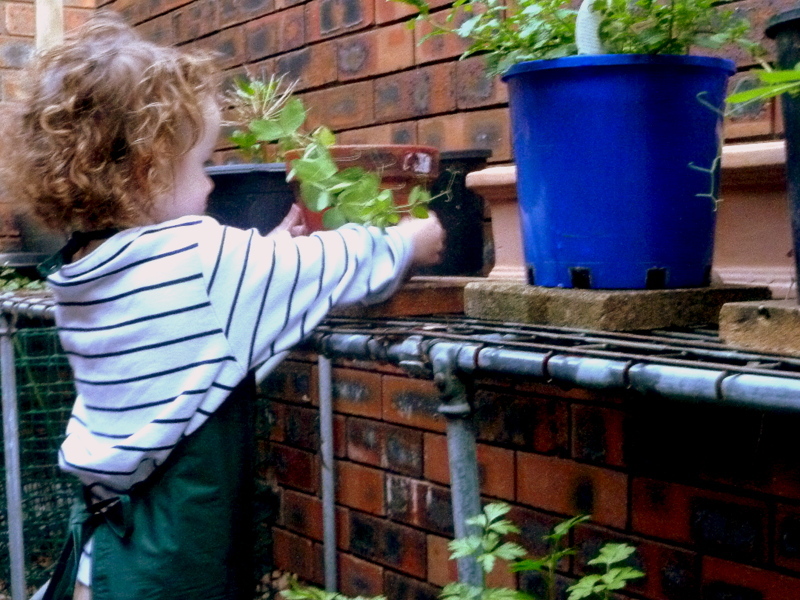 And the realisation for me that cooking can be a rewarding activity with a young toddler. 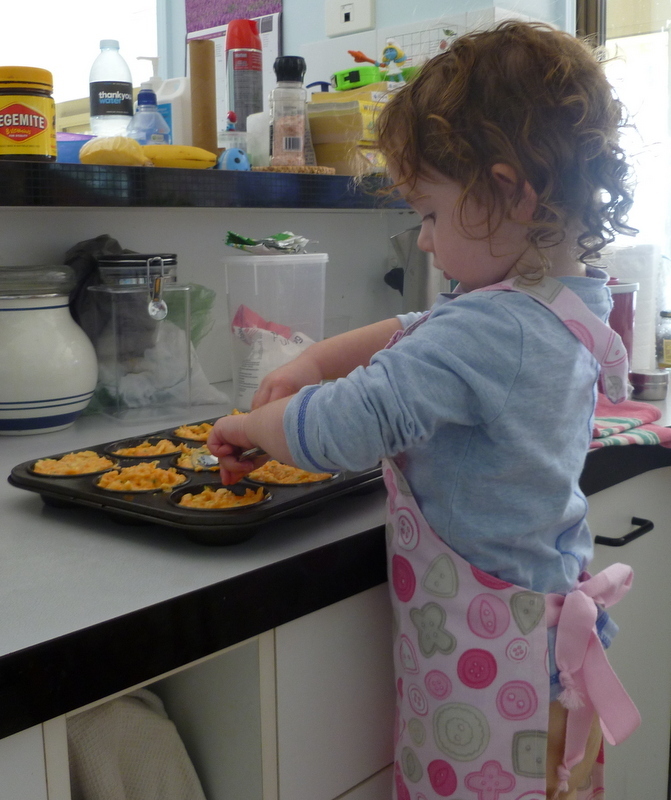 What is your favourite recipe when your toddler is your sous-chef? 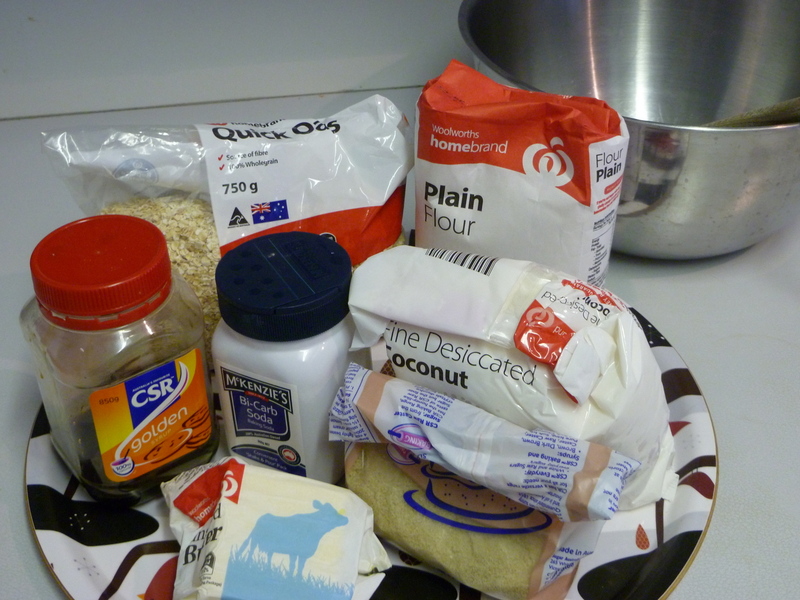 This entry was posted in Food and tagged ANZAC, Anzac biscuits, butter, coconut, Golden syrup, sous-chef on November 23, 2013 by Laura.